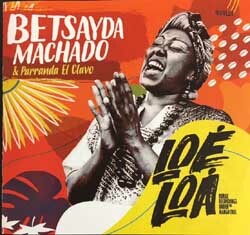 Betsayda Machado is one of the great voices of Venezuela. 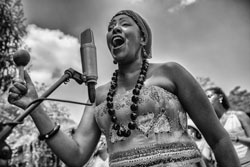 Raised in the small village of El Clavo in the region of Barlovento, her recent rural recordings with lifelong friends Parranda El Clavo brings new attention to Venezuelan Afro-Soul: 'Tambor.' A spirit-shaking percussion and voice fiesta, said to make dancers float. Alongside La Parranda, Betsayda is celebrating their 30 year anniversary with a series of concerts and residencies that will most likely come near you. Join their mailing list to learn more. RootsWorld's Michael Stone writes about the power of the ensemble's "rendering of Venezuelan parranda and its uniquely local communal expression of the transcendent vagaries of the human condition. A powerful call-and-response choral group backed by a potent percussion array, versed in the tradition's dense polyrhythms and allied dance genres, the ensemble evinces palpable cultural and historical kinship with expressive forms encountered from Brazil to Cuba, Latin New York, Puerto Rico, the Dominican Republic, Haiti, Caribbean Panama and Central America..."
These CDs were donated by the artists and Odelia Records, so all proceeds go to support the magazine and radio program. We thank them for their generous support.